A directing capstone project in the Conservatory, 'She Kills Monsters' runs March 30-April 1 on Stage III. 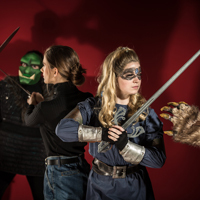 The Conservatory of Theatre Arts in Webster University's Leigh Gerdine College of Fine Arts presents the directing capstone project, "She Kills Monsters," a comedic romp into the world of fantasy role-playing games on Stage III March 30-April 1. "She Kills Monsters" tells the story of Agnes Evans as she leaves her childhood home in Ohio following the death of her teenage sister, Tilly. When Agnes finds Tilly’s Dungeons & Dragons notebook, however, she stumbles into a journey of discovery and action-packed adventure in the imaginary world that was Tilly’s refuge. In this high-octane dramatic comedy laden with homicidal fairies, nasty ogres, and 90s pop culture, acclaimed playwright Qui Nguyen offers a heart-pounding homage to the geek and warrior within us all. This performance is directed by Conservatory student Gio Bakunawa. For tickets to all Conservatory of Theatre Arts productions, call, (314) 968-7128. Admission is free for Webster students, faculty, and staff with a valid ID. Other admission is $15 for adults; $7 for seniors, alumni, and non-Webster students.